Back at the start of the year, I was delighted to be asked by the wonderful women who organised the brilliant DiverseAThon (an initiative to make people read more widely and diversely over a week and then hopefully for even longer) and I leapt at the chance. 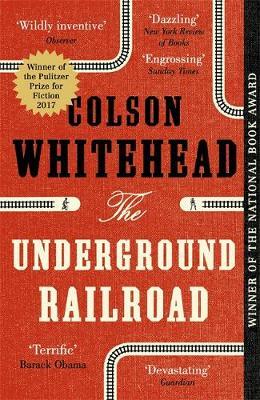 Part of the week of reading involved a group read of Colson Whitehead’s The Underground Railroad. This was a book I’d had on my shelf a while and been meaning to get to because the premise sounded so interesting, taking the figurative ‘underground railroad’ which was a network of safe houses that many slaves escaped their confines from (by 1850 it was estimated over 100,000 slaves had used it to escape) and turning it a real physical railroad, underground. I was both intrigued and slightly nervous about how someone would give slavery this speculative twist and how it would work. Yet we need to try things that make us a little nervous, don’t we? Plus, I was hosting the twitter discussion around the book and so on I read. I am always encouraged when a novel takes me straight into the heart of its own story. No preamble, no waffle, let’s just get on with it. (Somewhat ironic because preamble and waffle could be two of my middle names.) Carlson Whitehead does this with The Underground Railroad as we are taken directly into the life of Cora, a young woman living on plantation in Georgia. To use the word ‘hard’ for Cora’s situation would be a huge understatement. As we follow her daily life we are taken back to the witness both the escape of her mother which left Cora abandoned and to fend for heslef as well as the abuse she receives from some of those enslaved with her as well as the treatment. Cora’s life is a difficult one to read, Whitehead rightly writing about it in its full spectrum of horror, yet we can barely even grasp how horrendous that life must have been to live. A feeling settled over Cora. She had not been under its spell in years, since she brought the hatchet down on Blake’s doghouse and sent the splinters into the air. She had seen men hung from trees and left for buzzards and crows. Women carved open to the bones with the cat-o-nine-tails. Bodies alive roasted on pyres. Feet cut off to prevent escape and hands cut off to prevent theft. She had seen boys and girs younger than this beaten and had done nothing. This night the feeling had settled on her heart again. It grabbed hold of her and before the slave apart of her caught up with the human part of her, she was bent over the boy’s body as a shield. She held the cane in her left hand like a swamp man handling a snake and saw the ornament at its tip. The silver wolf bared its silver teeth. Then the cane was out of her hand. It came down on her head. It crashed down again and this time the silver teeth ripped across her eyes and her blood splattered the dirt. Yet after an act of rebellion a fire that seems to have been building in Cora’s soul, no matter how many awful things are done to supress it, an unlikey friendship with a fellow slave, Caesar, soon leads to a plan to escape on The Underground Railroad, a train that will lead them to another city and hopefully freedom. Here the novel goes from a tale of horrors to a tale of glimmer of hope and adventure as they plot and figure out just how to make their great escape. They met at the schoolhouse, by the milk house after the work there was done, wherever they could. Now that she had cast her lot with him and his scheme, she bristled with ideas. Cora suggested they wait for the full moon. Caeser countered that after Big Anthony’s escape the overseers and bosses had increased their scrutiny and would be extra vigilant on the full moon, the white beacon that so often agitated the with a mind to run. No, he said. He wanted to go as soon as possible. The following night. The waxing moon would have to suffice. Agents of the underground railroad would be waiting. It is at this point that Whitehead brings us The Underground Railroad itself. Interestingly as you are reading up to this point you feel a strange kind of anticipation, delight and marvel at its arrival from beneath a desolate building under a dusty trapdoor where nothing but a barren station seems to be waiting. Here, Whitehead does something really interesting both in terms of the device of the railroad and the plot. You see the railroad is at once somehow magical and impossible yet very much real. The only way to describe it, which seems such a cop out in some ways, is as a speculative being. Not because we know that it didn’t ‘literally’ exist but because the railroad never really knows where it is going to take you. It could whisk you to Mexico or Canada and safety (I found this particulatly poignant considering America’s current president and his immigration and refugee rhetoric) or it could find you in somewhere much less hospitable. It is a magical lottery or a dangerous game of chance. As Cora heads north, you might think that the story is going to become a tale of her arriving at the next destination and setting up a comfortable new life. Whitehead has far more in store for her than that taking us from one destination to another and in doing so depicting a much broader and also all the more unnerving vision of America at the time. From one stop in a small town she would have been better not to have ended up in, to a city which seems so pristine and hopeful and yet has some very dark secrets hiding behind its seemingly forward thinking and accepting façade. I will only add one small thing here in terms of plot as I really feel to best experience Cora’s story is to simply go on this journey (sorry, I hate that expression) with her. However, I do have to add that what I found wonderful about this book is the characters, be they at the forefront or in the background no matter how long they are in the novel for. Whitehead manages to capture the essence of the slaves, those who sympathised with them and wanted to help them and those who hated them and wanted to capture, own and punish them. From a couple who risk everything to help Cora, to Ridgeway an utterly contemptible man – one of those villains you really, really, really love to hate and adds a Victorian-like cat and mouse element to the book. From a character who appears for the briefest of times (I won’t give their name away but I will say I wept at their exit from the tale) to Cora herself who is one of those lead characters who just has your heart from the start. The Underground Railroad is a fantastic book. Brimming with both the horrors and hopes of life. My slight quibble, and it is slight yet something I felt, might be that I would have liked another stop or two on the underground railroad but then how much can any character or reader endure in one book? See, very slight quibble. It is not often I say a book should be a staple read in everyone’s literary diet but as Obama has already done so with this book I feel I can. Whilst creating a brilliantly written gripping tale of adventure Whitehead reminds us unflinchingly of the horrors of slavery and the past which provides a dark mirror to what is going on in America now. The Underground Railroad feels at once like a contemporary new voice and take on this subject whilst also being part of the rich existing canon of fiction around the subject.